Concert dress. If those two words leave you scratching your head, you've come to the right place. On this page you will find an article addressing every aspect and question you may have about proper concert attire. I can help you find the perfect little black dress for your next 'night out' on stage...only it's not little, it's long, has sleeves, and no plunging necklines. By the time you finish reading this, not only will you be an expert on performance apparel, but you will also be armed with the right information to look like a ‘classy’ musician at your next violin recital. Basically, ‘Concert Dress’ refers to the style and standards of clothes that musicians wear while performing. Typically it consists of black dress clothing; for men: tuxedo style clothing, for women: longer skirts or dresses. Look through the list below for more in-depth related topics. If you want to learn more about professional concert dress, here are some hot tips and easy to follow guidelines. Comfort and coverage are key to dressing like a professional. Good bye embarrasing sweat stains, hello beautiful music. Learn how to stop excessive sweating before your next classical concert. I have shopped around for concert dress, believe me I have. There are some really unique great boutiques out there that sell black dresses. If you can find one you like, great! But just two quick tips before purchasing. First, check the sleeves. If you can't lift your arms, you can't play the violin! Little cap sleeves often make this hard, and many orchestras do not allow sleeveless. Second, beware of sweat marks. Different styles of fabric can show sweat easier than others and some can even permanently stain or discolor the fabric...yikes! That is why time and time again I come back to the same dress I have had since I was 14, my simple but elegant stretchy velvet dress . Oh yeah, it still fits me! (Don't tell anyone the reason is because it's "stretchy"). They are the best, and usually pretty affordable to boot! Stretchy velvet dresses don't show sweat marks, they stretch and move with your arms, they are wrinkle free after being packed in suitcases or backpacks, and they drape elegantly in seated position (I have actually been told that specifically by audience members after performances). They really are the best out there, oh wait, I already said that! Trust me on this and go buy one today. 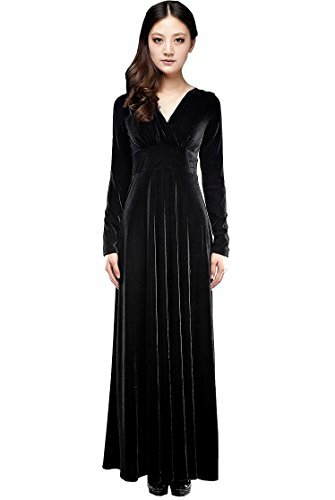 I know stretchy velvet comes and goes in style trends, but I promise, you will love your stretchy velvet concert dress even when it's not in season with runway models. Besides, who cares as long as you are comfortable while playing, and believe me you will be.